President Muhammadu Buhari has directed security agencies to stop the killings, criminality in the country and improve their strategies on intelligence gathering, surveillance and accuracy in deployments. The President made this known on Thursday during an official visit to Zamfara State, where he held an interactive meeting with political leaders, traditional rulers, elders and victims of criminal attacks in the state. In a statement through his Spokesman, Femi Adesina, the President said, “As far as I am concerned, our security agencies have recorded some successes, but they need to do much more. “They are not to oppress anyone, but they have to gather and send intelligence and warnings when something is about to happen,’’ he said. The President commended the security agencies for eliminating a dreadful criminal, “Buhari general’’, who had for many years initiated killings and destruction of properties. “Before “Buharin-daji”, who calls himself a general, there was a criminal who killed many people and he was killed; “Buharin–daji’’ has followed him and others like them should also follow,’’ he added. The President said the threats to lives and properties will be significantly reduced with improved relations among community leaders, citizens and the security agencies. “I have come here to commiserate with you over the loss of lives and properties. We will continue to do our best to improve the security situation. However, those committing atrocities live with you. Some of these people are not reported because you don’t trust the security outfits, instead, you report back to the criminals. We should give priority to security’’ he said. He warned that the ongoing war against corruption will be reinvigorated and sustained by public officers, who abused their positions, faced the wrath of the law. He also told the elders and traditional rulers that properties that had been confiscated by security outfits from some suspected corrupt public officials will be sold out, after the completion of court procedures. The President urged Nigerians to take advantage of the ongoing reforms in the agricultural sector, pointing that the era of depending on petrol will one day come to an end. 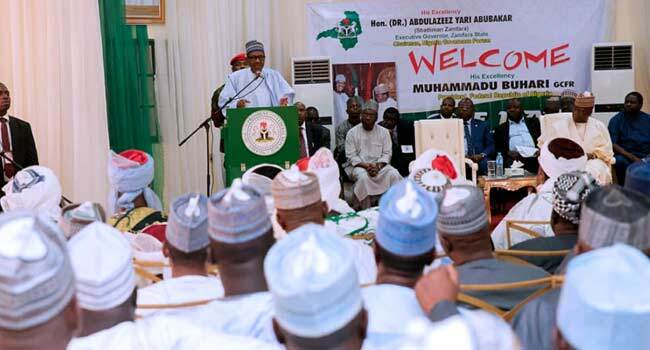 On herdsmen attacks, the President said there was a need to revisit and review the old grazing area arrangements that guaranteed harmonious relationship between farmers and herdsmen, where differences were amicably resolved through the law without violence. The governor, who commended the security outfits for working hard to protect the state, pleaded with the Federal Government to improve the funding of operations, increase the number of security men working in the state and reimburse the state for monies spent on some Federal Government projects like roads, which he said was a major priority in fighting criminals. In his presentation, the Secretary to the State Government, Prof. Abdullahi Shinkafi, said the state faced three major criminal challenges of cattle rustling, armed banditry and abductions and demand for ransoms. Listing out eight major flashpoints, the Secretary to the Government said 1,321 lives had been lost since 2011, while 1,881 people sustained various injuries from attacks, with about N14 billion spent on fighting the menace.